You know “that fan”-or maybe you ARE “that fan”-eagerly awaiting your team’s entrance onto the field, or court, living for the kickoff, or tipoff, and the start to an exciting season cheering on your favorite players as they advance to win. You have your team’s logo emblazoned on everything from your “lucky” shirt to your favorite chair. You fly your team’s banner from your front porch. You’re proud to show your colors. If you are that die-hard sports fan, you should look into sports team floor coatings from Prestige Floor Coating. Sports fans looking to support their team can do so proudly with our sports team floor coatings. More than just your typical protective epoxy coating, sports team floor coatings allow the die-hard fans of the Washington Redskins, Baltimore Ravens, and many other professional and collegiate teams, to make their allegiance known inside and out. Imagine the reaction you’ll receive from your fellow fans when they see your garage floor protected and insulated in the black, purple, gold and white of the Baltimore Ravens. Thrill your family with a basement floor resplendent in its display of Ohio state Buckeye crimson and grey, ready for game day, or any day, as an homage to your alma mater or favorite Big 10 team. Just as protective and professional as our other floor coatings, sports team floor coating products are customized to your specifications. Our five-layer system is designed in-house by our own chemists, in order to offer you a floor that is virtually impenetrable. Because our floor epoxies are formulated specifically for east coast climates, you can be assured of their resiliency. No matter how cold, or humid, or hot the weather gets, our sports team floor coatings will remain intact. We’re so sure of our floor coatings we warranty them for life. Our professional application of your sports team floor coating ensures complete coverage and protection against caustic chemicals, scratches, breaks in the seal and harsh UV rays. Your team colors won’t fade or bleach out. We prepare your cement floor by making sure it’s even and there are no cracks, holes, or crevices. We apply a base and primer. Then we add a color coat and broadcast colored chips while still wet, making for an even blend and adherence. Finally, we finish your sports team floor coating with 2 applications of our clear, protective coat. The entire process takes roughly two to three days and lasts a lifetime, adding appeal and value to your home. Sports team floor coating, like all of Prestige Floor Coating products, provide safety against slip-and-fall accidents and skids. Our ultra-sealing product also provides insulation so when the real northeast-style football weather hits, it won’t create additional chill in your garage or basement, outside patio, or anteroom. Your new floor coating is also sound-absorbent, so go ahead and scream your team to victory. Prestige Floor Coating has a complete selection of team colors for sports team floor coating. 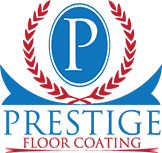 Prestige offers professional application, working with you to achieve the floor coverage you desire. We guarantee your satisfaction. If you’re “that fan” and want to protect your cement floor while showing your team spirit and dedication, contact us online for more information or to request your free estimate.